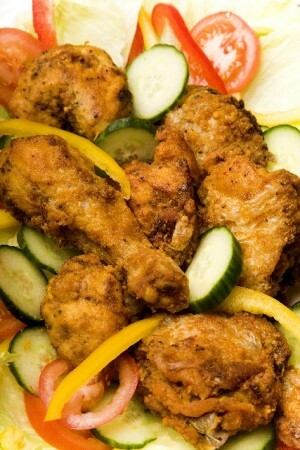 Dhaka Fried Chicken recipe by abrarhussain_73 at DesiRecipes.com. Take A bowl and put All purpose flour (maida ), corn flour, eggs and the rest of the dry ingredients. thin add some more flour). Mix it well for 5 minutes. Now wash chicken pieces thoroughly. absorbed by the chicken ). Put all the Chicken pieces in the batter and toss them evenly. Meanwhile, put oil in a wok (karahi) and let it heat on a high flame. To check if the oil is ready for frying take the oil from wok and pour it on a side of wok if it slips faster thats mean the oil is heated. also for checking put drop of batter in oil (but be careful) and check whether oil is heated. Take a chicken piece turn it two or three time in batter and then toss it in sesame seeds (apply as much as you like). Put it in oil for frying (put two pieces or three at a time) keep in mind the oil should be completely hot. Fry all the Chicken pieces on medium heat(otherwise it will be done from outside but inside will remain uncook). Keep turning them ocassionally and fry them for atleast 10 min or until its cooked from inside and crisp golden brown from outside. Delicious fried chicken is ready. Serve hot with french fries, salad or however you want. Enjoy!!! !